50 Things About Me: 3/31 Days of Blogging Challenge! 1. 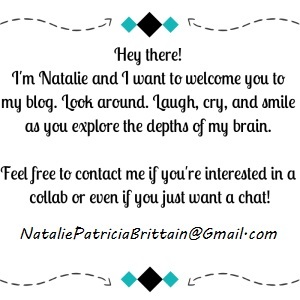 Full name Natalie Patricia Brittain 2. Zodiac sign Scorpio (November 5th) 3. 3 fears Heights. Spiders. Zombies (I know they're not real but they freak me out!) 4. 3 things I love Musicals, writing, happiness. 5. My best friend I don’t think I have a best friend, instead, I have many close friends. 6.… Continue reading 50 Things About Me: 3/31 Days of Blogging Challenge!